The 1912 Villisca Axe Murders Blog: Vote "Villisca" On to Victory! Vote "Villisca" On to Victory! Villisca: Living with a Mystery has been nominated for a Capote Award in the Best True Crime Documentary category. 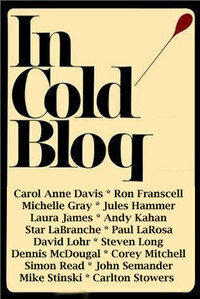 The winner is decided by votes from visitors to In Cold Blog, a true crime blog. Can you help us win by voting for Villisca? Visit http://incoldblogger.blogspot.com/, look for Villisca in the right hand column, cast your vote (ignore the ads!) and see the results in real time. You can vote once a day, or twice a day if you use a different computer at work. Voting may continue for another week. We're in a close race with another film, so every vote counts! Thanks for helping us increase awareness of the Villisca story and our true crime documentary film on DVD. Check back soon for final award results!